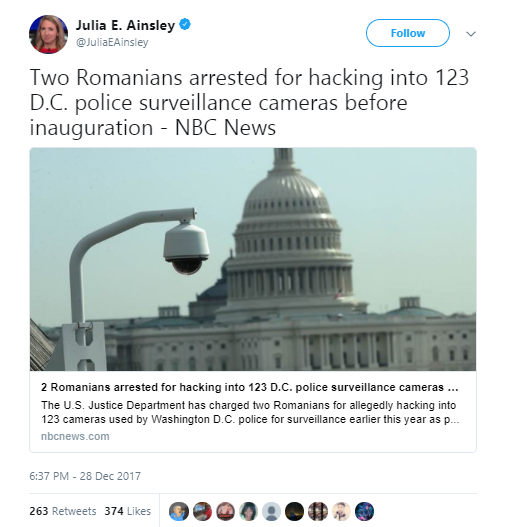 Two Romanians were charged with hacking into more than 100 surveillance cameras used by Washington D.C. police just days before President Trump’s inauguration, according to a federal criminal complaint. Mihai Alexandru Isvanca, 25, and Eveline Cismaru, 28, have been charged with conspiracy to commit wire fraud and conspiracy to commit computer fraud, according to the complaint. The two were arrested earlier this month at an airport in Bucharest. In January, 123 of the D.C. police department’s 187 outdoor cameras were unable to record for multiple days due to the hacking. On January 12, police noticed that the surveillance cameras had been compromised by non-police users. Over the next few days, all software was removed from the devices after being taken offline. The system then needed to be restarted at each site. “This case was of the highest priority due to its impact on the Secret Service’s protective mission and its potential effect on the security plan for the 2017 Presidential Inauguration,” Bill Miller, a spokesman for U.S. Attorney Jessie K. Liu, said in a statement, according to The Washington Post. The two Romanians are also accused of using the hacked computers to distribute ransomware through 179,000 phishing emails. Prosecutors are seeking extradition for the two Romanians. The pair face up to 20 years in prison if convicted.